The Blackhawks have acquired the 83rd-overall selection in the 2014 National Hockey League Draft from the Calgary Flames in exchange for forward Brandon Bollig. The St. Charles, Mo., native recorded 14 points (7G, 7A) in 125 regular-season games and two points (1G, 1A) in 24 playoff contests with the Hawks. With the 83rd pick, the Hawks took Matheson Iacopelli, who is listed below. Bulls get McDermott from Denver for their first round picks. DEERFIELD—The Bulls got their man, trading their two first-round picks for sharp-shooting forward Doug McDermott, who was taken 11th by the Denver Nuggets.The deal also will send Anthony Randolph to Chicago and a future second-round pick to Denver.The Bulls were high on the former Creighton star all season, scouting him a number of times. They were also looking for a trade partner for the 16th and 19th picks to shave money off next year’s salary cap.Is that a good sign for the Bulls’ free agent hopes this summer? While the Bulls pursue free agent Carmelo Anthony, getting McDermott addresses one of their biggest needs: shooting and scoring. The Bulls are certainly getting a guy who knows how to score the basketball. After four years at Creighton, Doug McDermott is fifth on the points list in Division I history.As a team, the Bulls shot 42 percent from the field and 33.3 percent on 3-pointers last year. They were the lowest-scoring team in the NBA, averaging 93.7 points per game without Derrick Rose for all but 10 games.Mike Dunleavy and Kirk Hinrich were the only reliable long-ranger shooters on the roster. Hinrich is a free agent, and Dunleavy could be prime bait in a sign-and-trade deal.McDermott was the consensus college player of the year during his senior season, averaging 26.7 points, shooting 52.6 percent from the field and 45 percent from 3-point ranger.McDermott is the fifth-highest scorer in Division I history with 3,150 points, and he is a career .458 shooter from 3-point range.McDermott could play the post in college, and was measured at 6-foot-7-3/4 with shoes on at the NBA draft combine.With the 16th pick, the Bulls took Bosnian center Jusuf Nurkic and then took Michigan State guard Gary Harris at No. 19. Both players were shipped to Denver as part of the deal. Carmelo to visit Bulls and other teams. It’s not unexpected news, as the Bulls have been linked to Carmelo Anthony for quite some time, but it is notable. Anthoy opted out of the final year of his contract with the New York Knicks last week, making him an unrestricted free agent. He’ll have more suitors than the three teams Broussard reported, as the Los Angeles Lakers, Atlanta Hawks, Miami Heat and the Knicks are expected to make a run at the seven-time All-Star.Still, the Bulls are considered one of the front runners for Anthony, who reportedly has already begun inquiring about the Bulls and city of Chicago, which included asking a “high-profile person who lives in Chicago” what it’s like to be famous in the Windy City.There are still hurdles most teams in the hunt for Anthony to get over in terms of clearing enough cap space to sign the hottest free agent not named LeBron James. For the Bulls, that likely would require moving Taj Gibson, while the Rockets would need to shed the contracts of Jeremy Lin and Omer Asik. The Heat are in limbo as they await the decisions of Dwyane Wade and Chris Both, both of whom can opt out of their current contracts as James did earlier in the week, while the Lakers would likely need to dump Steve Nash’s remaining $9.7 million salary, which they could do in a trade by pairing their No. 6 pick in tomorrow’s draft.In terms of money, the Knicks are clear front runners. They can offer Anthony a maximum contract worth $125 million over five years, while the other 29 teams in the league would be restricted to offering a four-year, $90 million contract at most. Anthony said in an interview made public shortly after he opted out that his decision will be about more than money and/or championship potential, noting that as a family man he’s taking into consideration where his family would live and how moving cities could disrupt that; his wife and 7-year-old son are reportedly happy in New York.With five days until Anthony can meet with teams, there’s really no substance to any reports indicating that Anthony is leaning one way or another. Those interviews with teams’ upper management and coaching staffs likely will make the difference on where Anthony lines up, so as of now nothing has really changed on the free-agent landscape.The Bulls also are reportedly in the mix for Timberwolves forward Kevin Love, who has made known his desire to be traded before he becomes a free agent next year. The Bulls reportedly made an offer to the Timberwolves, and while it’s not as strong a package as the Warriors are contemplating giving up for Love, the Bulls do have two first-round picks in tomorrow’s draft that could be enticing for a Minnesota franchise that would essentially go into rebuilding mode by dealing the 25-year-old, three-time All-Star. LAS VEGAS—The Blackhawks Duncan Keith takes home his second Norris Trophy after an extremely productive season, leading all defensemen with 55 assists and finishing with 61 points, second among all defenseman. He last won the award in 2009-10. Keith was the top defenseman for the Hawks, averaging nearly 25 minutes a night and anchored one of the league’s best defenses.Keith’s award may come as a surprise to some as he did not garner the toughest defensive assignments on the team. That often went to Niklas Hjalmarsson, but Keith remains one of the best two-way defenders in the league. Blinding speed and a great stick has kept him one of the tougher guys to beat. Keith also made the All-NHL First Team. The Bulls are primed to have a very active offseason. With the way the roster has been constructed over the past few seasons, they’ve been relying on Derrick Rose to carry a defensive-centric team to the NBA championship. The problems with that are Rose doesn’t have much help on the offensive end of the floor and he hasn’t been able to stay on the floor either, due to injuries. The Bulls are apparently adamant about getting Rose some help. Adrian Wojnarowski of Yahoo Sports is reporting the Bulls are in pursuit of acquiring Arron Afflalo of the Orlando Magic. Afflalo was nearly an All-Star for a bad Magic team in 2013-14 and his contract situation leaves him as a good possibility to maximize a one season rental of the shooting guard before he hits free agency. Afflalo had the best season of his career in 2013-14, averaging career highs in scoring (18.2) and assists (3.4). He also hit a very impressive 42.7 percent from 3-point range on 300 attempts. Looking at the shooting guard options Rose has had next to him in the past, Afflalo would be a massive upgrade at the backcourt position. Rose has been paired withKeith Bogans, Richard Hamilton (way past his prime), and Jimmy Butler (solid role player but not as good as Afflalo).The Bulls are also said to be heavily in pursuit of Carmelo Anthony and could possibly be a trade destination for Kevin Love if the Carmelo attempts aren’t successful. Afflalo has two years lefton his contract at $7.5 million per season, but the second year is a player option. He’s expected to forego that player option and capitalize on being an unrestricted free agent. Rose ready if season started today? The Chicago Tribune reports in a mailbag with Bulls reporter K.C. Johnson that Derrick Rose has had no setbacks, is set to join Team USA for mini-camp before the World Cup, and that if the season started today, he would play. Don’t get me wrong: I’m thankful for the lack of daily updates on Derrick Rose’s rehab. But it’s been some time since we’ve heard now how it’s going. Is he still scheduled to participate in the Team USA activities? — Milt, Sawyer, Mich.
As previously reported, Rose began taking full contact in the form of one-on-one or two-on-two or three-on-three offday sessions late in the first-round series against the Wizards. Rose has had no setbacks and, if the season started tomorrow, would be fine to play. He remains on schedule to participate in the Team USA minicamp in Las Vegas at the end of July and hopes to make the World Cup team that will compete in Spain in late August through early September. Rose injured his knee in November and missed a second full season in a row. He hasn’t played a full season since 2012, and even then missed time. But his meniscus injury was less severe than the torn ACL he suffered in the playoffs two years ago.His participation in Team USA minicamp is a little concerning. Is he ready for that level of competition? Isn’t that deep water to drop into? And what does it say if Team USA looks at him, having not played competitive baskeball consistently for two years, and thinks he’s not fit to be on the team? There are some serious questions about Rose set to be answered. He thinks he’s ready, the Bulls think he’s ready.But is he ready? Anthony to opt out of Knicks contract. Bulls a possibility? Bulls Fans have been through this crap before.Four years ago LeBron James and Chris Bosh signed with Miami while the Bulls got the consolation prize, Carlos Boozer. And remember when the had to settle for Ron Mercer and Eddie Robinsion in 1999? Will this ‘Carmelo Anthony and Kevin Love’ off season provide even more disappointment and anger? Oh, and remember the Melo Drama of a couple years ago? It looks like it’s back and better than ever. With Anthony becoming a free agent at the end of the month and things in New York looking a little bleak with the Knicks, Anthony could be looking for new suitors and championship-ready teams to hopefully join this summer for the next stage of his career. It looks like he’s already leaning toward a couple of teams.Adrian Wojnarowski of Yahoo Sports is reporting that Anthony was relatively unfazed by a recent meeting with the Knicks’ brass and is leaning toward leaving the Knicks for a much better team. The top two teams from the article are the Bulls and the Houston Rockets, who both need to clear the necessary cap space first. New York Knicks star Carmelo Anthony is leaning toward leaving in pursuit of immediate championship contention, and awaits the Bulls and Houston Rockets to clear the necessary salary-cap space to sign him in free agency.As re-signing with the Knicks continues to fade as his priority, the Bulls and Houston have emerged as the clear frontrunners to acquire Anthony, league sources told Yahoo Sports. Anthony’s meeting with Knicks officials on Friday night had little impact on his state of mind, league sources said, because there remain too many uncertainties about how quickly president Phil Jackson can reshape the team into a championship contender.The Knicks’ horrendous season in 2013-14 — in which they not only failed to build on the successful 54-win season the year before but managed to miss the playoffs in a weak Eastern Conference completely — was probably eye-opening to Anthony. Even after hiring Phil Jackson to shape the roster and Derek Fisher to coach the team, the roster needs a lot of work and reworking in order to start approaching a championship contention. Anthony turned 30 a couple weeks ago and this will be his last contract in which he’s capable of being a major player. If the salary cap is going to be around $62 million like has been projected over the last couple months, that leaves the Bulls needing to clear roughly $20 million in room in order to sign him. They can take care of a big chunk of that money by using the amnesty clause on Carlos Boozer, who is slated to make $16 million next season, according to ShamSports.com. They’d also have to renounce the rights to their current free agents (Kirk Hinrich, D.J. Augustin, Jimmer Fredette, among others) and probably find a home for Mike Dunleavy’s $3.3 million contract for next season without taking anything back. It’s quite doable without even turning it into a sign-and-trade, although that would make it easier to work something out.The Rockets’ situation is much more complicated. They have a little over $62 million committed to the salary cap next season, putting them right up against the projected number. They have Jeremy Lin and Omer Asik on expiring deals but would probably have to package a draft pick or two with each player to move them for next to nothing in return. The Rockets would also have to figure out just how necessary it is to keep Chandler Parsons, Terrence Jones, and Patrick Beverley in some combination unless Anthony is willing to take less money to keep some depth to the roster. Can Bulls deal with Nuggets to move up to 11th Draft pick? There are reports that the Bulls are looking to trade their 16th and 19th picks together to the Denver Nuggets to move up to No. 11 and grab a shooter in this month’s draft.Denver has been making noise for the past two months, since they effectively fell out of the fifth spot when the Knicks went on a brief, useless winning streak, about trading out of their pick. No. 16 and No. 19 is a pretty good haul even if it’s not going to land them a elite player. They pick up a wing and a big man in those spots (Adreian Payne might be available there) and if they were to package those two picks with Kenneth Faried, they could really fetch something.So Denver wants to move, and the Bulls wan to move up. It’s rare that deals that get floated this early actually happen, but it’s out there. Michigan State’s Gary Harris and Michigan’s Nik Stauskas are possible sharp shooters the Bulls could then target. LAKE FOREST (CBS)—The first player “confrontation” of the summer went down Tuesday as defensive lineman Lamarr Houston and tight end Martellus Bennett exchanged words during the Bears’ fifth of 10 OTA practices. Generally, these things aren’t a big deal, and Tuesday’s was no exception, especially because Houston and Bennett are old friends. Bennett wasn’t available for comment afterward, but the whole ordeal appeared to start with right tackle Jordan Mills blocking Houston during a practice rep. Houston appeared to take exception to something — possibly Mills still blocking after the whistle — and it got more heated once Bennett got involved. Coach Mark Tressman was unhappy with the Bears players “wasting time” during Tuesday’s workout. 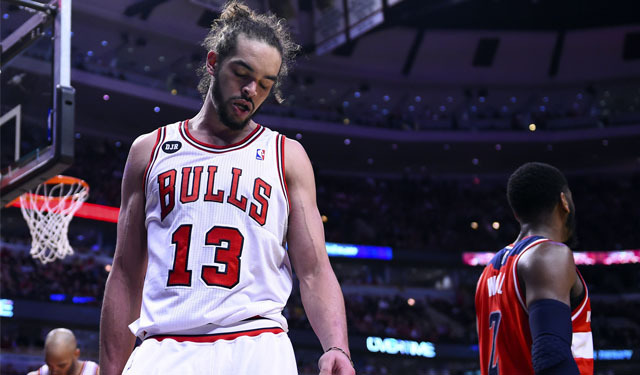 Joakim Noah top vote getter for NBA All-Defensive Team. NEW YORK—The NBA announced the All-Defensive First and Second teams on Monday with 2013-14 NBA Defensive Player of the Year Joakim Noah receiving the most first-place votes. The Bulls‘ center received 105 first-place votes (worth two points) and 13 second-place votes (worth one point) for a league leading 223 points. Also joining him on the All-Defense First team was Paul George of the Indiana Pacers, Andre Iguodala of the Golden State Warriors, Chris Paul of the Los Angeles Clippers, and Serge Ibaka of the Okahoma City Thunder. The All-Defensive Second team was composed of Jimmy Butler of the Bulls, Roy Hibbert from the Pacers, LeBron James of the Miami Heat, Kawhi Leonard of the San Antonio Spurs, and Patrick Beverley of the Houston Rockets. This was Noah’s third All-Defensive team and second straight appearance on the All-Defensive First team. Iguodala made the First team for the first time in his career, as did George. This was Ibaka’s third time on the First team and Paul’s fourth time. After five consecutive years of making the All-Defensive First team, LeBron made the Second team for just his first time. The Bulls Jimmy Butler and Kirk Hinrich also received votes.